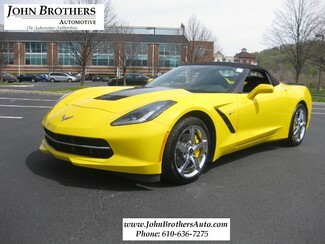 John Brothers Automotive (Your Corvette Store) Presents This Magnificent / As-New 2014 2LT Stingray Convertible! This C7 Vette Is In PRISTINE Overall Condition Both Inside And Out, And Looks Stunning And Striking In The Velocity Yellow Exterior Over Black Interior. This Corvette Has Been Properly Inspected And Freshly Serviced On Site, In Our Service Department- And Is A Car-Fax Certified 1-Owner Vehicle. NO Disappointments At All With This One. The Exceptional Condition Throughout, Provides Evidence To A Well Kept History.